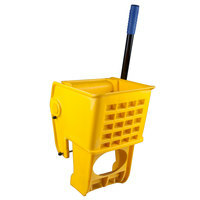 This replacement mop bucket wringer is designed to fit the 36 qt. Lavex Janitorial mop bucket, and others. It attaches and detaches easily, and features heavy duty springs for durability and superior performance. Don't replace your whole mop bucket if you only need the wringer! We ordered this wringer for our existing mop bucket, but unfortunately it wouldn't fit so I had to return it. I wouldn't recommend this because it didn't fit as a universal one. This is a great replacement mop bucket wringer. We have a 3 year old mop Rubbermaid bucket and the wringer was acting up. We decided to try this brand replacement and it worked without a problem. Seems sturdy enough to handle everyday cleaning. Seems pretty universal, fits on a different (generic) mop bucket. Seems to press the mop correctly. The dishwashers haven't complained about it, so i suspect it will work great, especially for the low price. Had issues with these wringers from day 1, but iv'e learned to tighten it up every so often and it's fine, worth what we paid. This replacement works well for my bucket. Much cheaper than at my local supply stores. Just as I expected, clean neat good product, and what I was looking for. We needed a replacement wringer for an industrial mop bucket in our restaurant and this item definitely fit the bill! Worked great and was a great value! Bought this to use on a different brand bucket, still fits perfect. Just wished it wrung out more water from the mop, even with heavier guys using it, it still doesn't wring out enough water. My wringer broke and I wasn't sure where to get a replacement that would fit the bucket. I tried this one because it was so low priced. It works well. It seems sort of lightweight and I don't know how long it will last. I ordered this product because of all the positive reviews and it had a good price, but when I received it, the product is was cracked. I contacted customer service and they very quickly took care of the issue. Great customer service!! This Lavex replacement mop bucket wringer for janitorial mop buckets is a great option versus having to buy a whole new mop bucket and wringer system. Very inexpensive mop bucket wringer compared to some other brands but does the same job. Would buy again and would recommend to anybody using a mop bucket wringer. But for best results use it only on lavex bucket. This mop bucket wringer is a good replacement for most universal mop bucket. However, my personal opinion is I like it more when the handle isn't straight. It seems and feels to me that it can take better pressure when it has a 45 degree handle. Replacement for the original one ordered as a set and this is exactly the same except for the color. It works well and is holding up so far. The lavex mop bucket wringer has worked well for us for years. It has lasted us a while as we have two in the building and have had both for over a year now. very nice price for the lavex replacement mop bucket wringer. Fits perfect to old existing bottom bucket. was shipped really fast and works great as expected. Tired of having to buy a completely new mop bucket when just the wringer needs replaced? So was i until i found this Lavex replacement wringer. It has fit on every brand bucket i have tried and costs way less. Bought this as a replacement for my rubbermaid wavebrake bucket. I should have read all the reviews... doesn't fit. Won't bother returning it as the return shipping and restocking fee would leave me in the negative. lesson learned. Maybe webstaurant can put in the description that it only fits Lavex brand and not guaranteed as a universal replacement. As for quality, it looks cheap but not much you can expect for the price. A very economically priced mop ringer. Delivered exactly as promised. I paid only a fraction of the price my local food provider would have charged by purchasing on Webstaurant Store! Mop wringers take a lot of beating in our restaurants and the Lavex wringer works well, is easy for our employees to use and most importantly lasts a long time. Great price and value. Broke in under 3 weeks. Entire steel mechanism failed. Might be ok for a quick fix or light duty with 24oz and under mop heads. Thank you for the review, Richard. We are very sorry this broke so soon! Our Customer Solutions team is always available to help! Please remember to contact them right away when an issue like this arises. It broke in less than a year. Very disappoint product. We Don't have a huge restaurant it should be lasting a little more than a few moths. We appreciate your review! If you have any concerns about the product you purchased please contact our Customer Solutions team as soon as possible. Thank you for the review, Lisa. We apologize that these broke for you. A Customer Solutions Representative will contact you shortly. It's so nice to have replacement wringers for mop buckets. If an old one needs to be replaced, it's easy just to buy a new one! This is great. The Lavex mop bucket wringer has been a great replacement for our previous mop bucket wringer. It's been durable and has done what we needed it to do. We go through many wringers here, now we finally can find them at a reasonable price! Great buy for the money but break easily when used alot! This product is exactly what I wanted. I use this product in my warehouse. This Mop Bucket Wringer takes the able if daily use and still stood strong. This item worked great in the industrial setting and took a lot of punishment. If using this for your home I see no reason for it to not last forever. This is a great replacement wringer. We use it daily in our sub shop and it has held up very well. The reason I give 4 stars is that there is only the mechanism on one side. Sometimes it can be awkward, however is great for the price. I bought this hoping it would fit another mop bucket. It does not, but the ringer is very sturdy, rings out water very well and fits on the Lavex mop bucket I bought afterwards, so I have a replacement if I need it. Thank you for reviewing this, Lisa! We are sorry you were not pleased with the quality of this mop bucket wringer. It is an excellent value for the price. Check out our Wet Mop Buckets / Wringers category for a wide variety of options to fit any price range. We used one wringer for 2 buckets for the longest time. They were pretty pricey elsewhere so I was just waiting till I found a reasonable one. This one fit and is durable. It was killer cheap too! What I like about this product is its not to heavy and easy to use. Have had no issues with this product along with many other products we have purchased from web. We are a busy dog day care and boarding facility, and mop buckets are a vital part of daily operation. We use and abuse them all day long, 7 days a week. The springs in our mop bucket wringers frequently break and replacing the entire combo adds up quickly. Replacing just the wringers allows us to keep our overhead costs down. This product over all functions well and is rather durable, generally lasting 2-3x longer than what we had been purchasing from local supply stores, and at a fraction of the cost! Thank you for offering a quality product at a reasonable price! The Replacement Mop Bucket Wringer for 36 qt. Lavex Mop Bucket works just fine. It is durable enough and the parts are holding up to a lot of use. Thanks for your review! This wringer is designed for a Lavex 36 Qt. Mop Bucket. You may find all compatible Lavex buckets in the Companion Items section of this page. what can i say, these are pretty inexpensive replacement mop bucket wringers. They are durable and the job well. I recommend these for any business. our old wringer for the mop bucket broke, but the bucket was still good. feel not to buy the whole set for nothing. found the good deal and quality for what exactly we needed. This mop replacement wringer has helped our restaurant continue its regular cleaning routine when our regular mom bucket with wringer broke, and was unusable to us. Thank you for the replacement. this one is working fine and so far had no problems. this one is much better and is not as rocky as the old one.